Learn to analyze and interpret imaginative literature through the careful reading and critical analysis of representative works from various genres and periods. Explore literary elements such as a work’s structure, style and themes, as well as the use of figurative language, imagery, symbolism and tone. Develop your writing skills as you express your ideas and analysis in expository, analytical, and argumentative essays. Interested in Taking AP English Literature and Composition? Does our school offer AP English Literature and Composition? 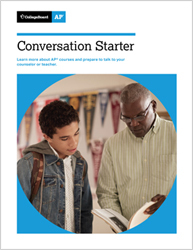 Visit our AP English Literature and Composition page.